On the third and final day of the '2013 Purification Azalea Festival for the Inheritance of Heavenly Fortune, Chung Pyung Special Great Works' the Global Worship Service for Victory of Vision 2020 was held at the CheongShim Peace World Center. Centering on True Parents of Heaven, Earth and Humankind, around 15,000 people (10,000 from Chung Pyung and 5,000 from Korea) gathered before the start at 10:00 am which was then held for 2 hours. This service was broadcasted over the internet and was able to be watched by smart phones as well. It was interpreted by Japanese and English. Before the service there was a singing by the singing team. They danced and sang beautiful songs and raised the atmosphere of the members at the CheongShim Peace World Center. After the opening address by Dr. Dong-woo Kim, Continental Director, FFWPU-Oceania, a great applause was given. Then there was a time to sing the Cheon Il Guk National Anthem and reciting of the Family Pledge. Then there was a cute song and dance performed by 45 Sun-hak Korean Children's Choir who sang 'Give me a wing' and 'Oh Happy Day'. Then there was the first video presentation with the title 'Origin of new era' which was a commemorative video of True Parents holy marriage. Then Dr. Chang-shik Yang, FFWPU International Vice-President came to the stage and gave words about the strategy for the victory of vision 2020 and reported the recent situation. 'Vision 2020' is a project to bring 43 nations out of the 194 in the world in front of heaven by the year 2020 which is the year when True Father would celebrate his 100th year. Rev. Yang gave 3 directions for the completion of vision 2020, 1: Systematic Leadership from Charismatic Leaders, 2: center on families, 3: the path of clan Messiah. At the end he said, 'We mustn't give up' and promised for the victory of Vision 2020. Then there was the 2nd video presentation with a title 'New Spring of the Providence, Glory of Foundation Day to the ends of the world'. 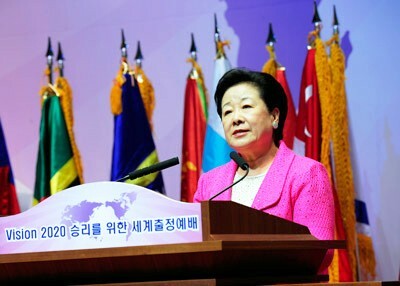 The video showed True Mothers words at 'Commemorative Service at Heavenly Parents' Day', 'Inauguration of Wonmo pyeongae Foundation', and the 'World Summit 2013'. The attendants were able to re-engrave True Mother's strong message through the commemorative video into their hearts. True Parents of Heaven, Earth and Humankind entered the stage as all the members stood at their seats. Then there was the offering of flowers by Mr. Yabuki Kyoichi, District Leader, District 1 and Mrs. Nakajado Rumiko, Leader of Blessed Wives, District 1, Hokkaido HQ. True Mother received the flowers and shook hands with the representatives. The emcee asked all the members attending through the live broadcast to offer a bow to Korea and continued with the service. True Mother was then welcomed by all the members with a great applause to the altar. During her speech, True Mother would hold her breathe and wipe her tears as she seemed to be thinking about True Father. She said, "The children of Unification Family must inherit the traditions of True Parents of Heaven, Earth and Humankind with absolute faith, fulfill your responsibility as clan messiahs, and do your best to create the people of Cheon Il Guk which was dreamt by heavenly parents and True Parents of Heaven, Earth and Humankind." Then True Mother said, "You must restore the 7 billion people on this earth back to True Parents of Heaven, Earth and Humankind who opened this New Era and New Nation of Cheon Il Guk" and emphasized that we must become children who will never stop with life-or-death decision and investing one's entire being. The kick-off ceremony of Vision 2020 was then held by the entrance of flag bearers of the 43 nations which was carried by the 43 students of UPAcademy. Members welcomed the flag bearers with great applause. Then there was the oath by representatives of nations for the victory of vision 2020 and when the representatives said 'Resolution!' the members who filled the CheongShim Peace World Center followed with a very loud 'Resolution!'. After the oath True Mother held the send-off declaration and offered the benediction prayer for the victory of vision 2020. Then Rev. Yong-cheon Song, Chairman of the Unification Movement, Japan shouted the 3 cheers of Eok-manse. The Global Worship Service for the Victory of Vision 2020 ended successfully. There was a great applause and cheers by the attending members when True Mother left the stage. Everyone shouted, 'We love you True Parents!' until she left the building. True Mother waved until the end and promised to meet again.